This is a knitting pattern for a customizable shawl. This pattern is for any weight yarn! 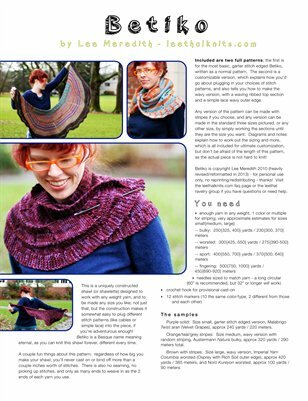 A uniquely constructed shawl (or shawlette) designed to work in any gauge, and to be made any size you like. A couple fun things about this pattern: regardless of how big you make your shawl, you’ll never cast on or bind off more than a couple inches worth of stitches. There is also no seaming, no picking up stitches, and only as many ends to weave in as the 2 ends of each yarn you use. Included are two versions of the pattern; basic, garter stitch edged Betiko, written as a normal pattern, and a customizable version, which also tells you how to make the wavy version. See the Betiko page on leethalknits.com or on ravelry.com for photos and more details about the pattern.